Ashun Wu's caddie was passionate in his plea for Wu to bail out in the fairway instead of trying a riskier shot over the water. 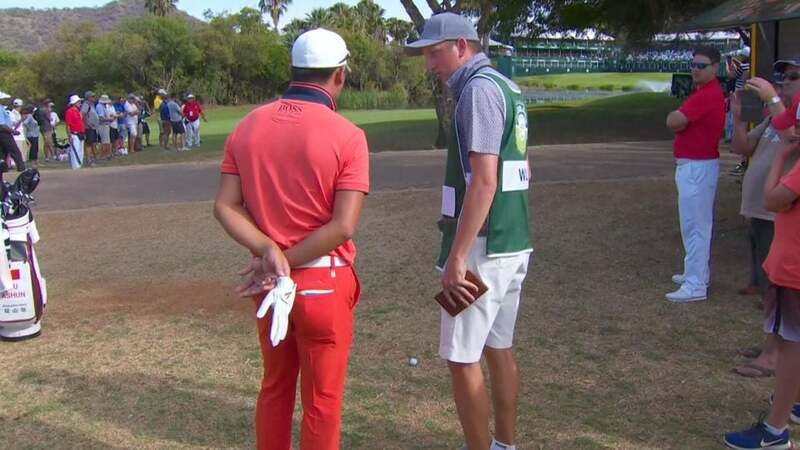 If you've ever wondered just how much value a Tour caddie brings to his or her player, a video of a passionate plea from Ashun Wu's caddie to make the safe play at the Nedbank Golf Challenge in South Africa is the perfect example. When Wu found himself in hardpan to the right of the fairway on the 18th hole during the second round, cameras captured the conversation between player and caddie as they discussed how to proceed. Wu appears to want to hit a hero shot — a low long iron over water to the green, and his caddie is adamant that a bail-out is the right play. "Please go back to the fairway," the caddie pleads, as Wu sizes up his lie and stance. "You'll make par, worst thing's bogey," the caddie continues. "If you don't carry, you're looking at 6 [double-bogey]." Wu appears unconvinced. Finally, exasperated, the caddie says, "Stop being crazy! Just go back to the fairway!" "[Wu's caddie] is absolutely determined that his man is going to play the shot that he thinks he should be playing," the broadcast commentator says. When the gallery hears the caddie's final plea, the spectators react with laughter, and that finally seems to change Wu's mind. He smiles too, and decides to chip back into the fairway at last. As it turns out, the caddie was right. Wu salvaged a bogey on the hole, and heads into the final round at T20, 10 shots back of Sergio Garcia's lead. It should be noted that Wu is an experienced player on the international stage, with three career European Tour wins, including this year's KLM Open in the Netherlands. You can watch a video of the entire interaction below.